By Ludovico Einaudi. Arranged by Derek Hasted. Score, Set of Parts. 14 pages. Published by Derek Hasted (H0.550629-SC001278656). 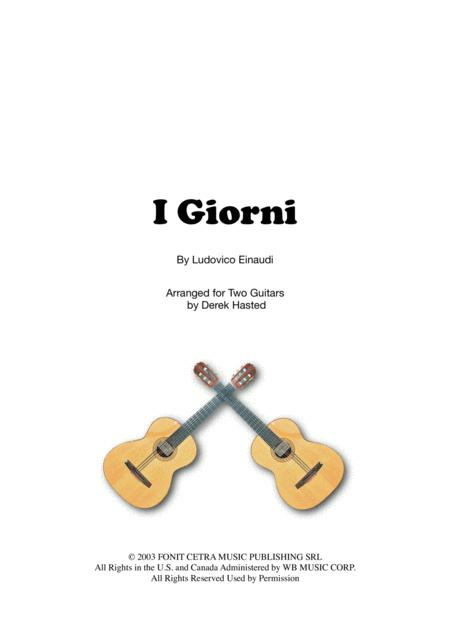 Derek Hasted writes "Ludovico Einaudi has a reputation for gentle, reflective music. This arrangement is for two guitars (but it would work well with a large group too). I’ve kept the same key as the original and ihe arpeggios here are guitar-friendly and ring on nicely (as indicated at the start of the score). One or two passages have needed to be moved by an octave - for example the opening - and here I have suggested taking the melody high up the neck so that the sustain of the fourth string will cut through the arpeggios that are (in this arrangement) similar in pitch. Where possible I’ve switched the tune and accompaniment between players at phrase boundaries, so that there is a stunning stereo effect to lift the interest in what can otherwise be repetitive moments in the piece. It’s possible to keep a good deal of the sustain at the point where the phrases swap over. This is one of a large and growing range of accessible ensembles from experienced arranger Derek Hasted, and is supplied as full score and parts. Check out Derek's other arrangements - search SheetMusicPlus for Derek Hasted and you'll see the full list, all with soundclips and sample score.